Recently we had a children's musician, Dino O'Dell come in to the library for a Halloween program. He preforms a piece about pizza and had mentioned something about it in the program description. I didn't realize it was referring to a song and not to actual pizza. Neither did our patrons. 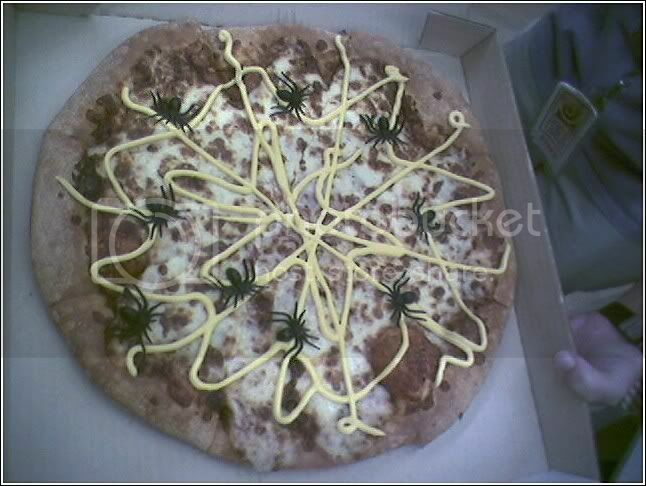 People kept saying how excited they were to try his spiderleg and cobweb pizza. We were in a little bit of a pickle when we realized that there was no pizza. I had primarily been the one telling people who asked that yes there was pizza. The other librarians had heard the song before. (That's me, the librarian who spreads disinformation). So we got pizza. And then I had my flash of genius. I drew on cobwebs with that string/spray cheese that comes out of a can (called Easy Cheese, not cheez whiz, cheez whiz comes in a jar, this was a matter of great debate among the chidlren's staff and we did eventually have to look it up). I also put on little plastic spiders. The results looked fabulous. 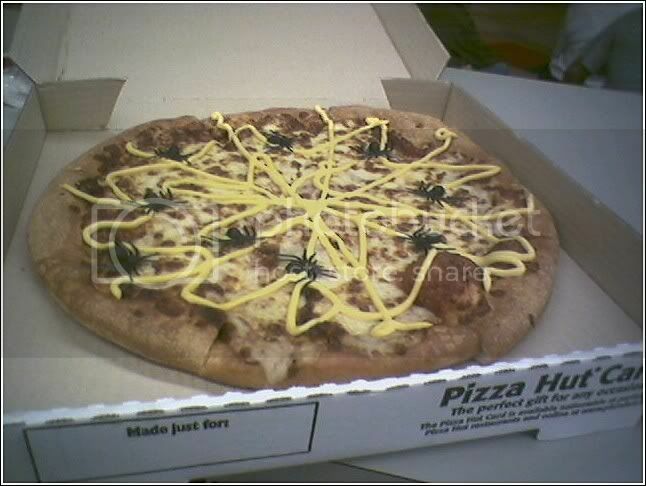 (That canned spray cheese is disgusting so we had some pizzas without "cobwebs" also because I only bought one can). I took some pictures, but with my cell phone so they're not the greatest quality. See how cool they look? (This is just the last one eaten and the only one remaining when it occurred to me to take photos.) I'm ridiculously proud of this. One patron told me she was stealing the idea for her halloween pizza party. Edible string would work too, but edible string is harder to find and harder to convince children that it is edible. I saw one little girl lean over and "whisper" conspiratorily to her brother, "the cobwebs are just cheese". If you wish to attempt this yourself, easy cheese comes in multiple flavors. I used American, and it still didn't taste good (in my opinion). Also one can of easy cheese (sold in the cracker aisle) will draw cobwebs on about four large pizzas. I believe that I promised a piratatical themed storytime and comments on the same. No one is reading this yet, but I hope that someday when it is read, it will be useful to go through the archives. There is a ton of stuff out there on pirates including a very recent PubYac compilation. Here are some of my favorites. If you're a pirate and you know it, then you'll hear the sea winds blowin. I wrote this one, so please use it but give credit! I'm proud of my "piggyback" song creation. Someday I'm going to publish all of them. The rest of these I did not write. A terrible, fearsome ocean thief. This is a fun one to use cumilitively. Add action after action, until the child is standing balanced on one leg, an eye covered, arm in a hook. They'll giggle as they try to stay upright. It isn't easy for me to do (especially in heels). This one is easy to sing, simple tune. If you start singing, I bet you'll fall into the "right" tune. And the kids seemed to love it. I did it at storytime, big hit. I did it with 2nd and 3rd graders at a school visit and they were really getting into the rocking forward and back and to each side. Simple, but great with younger kids. Coming up: Reviews of Pirate picture books for storytime usage!